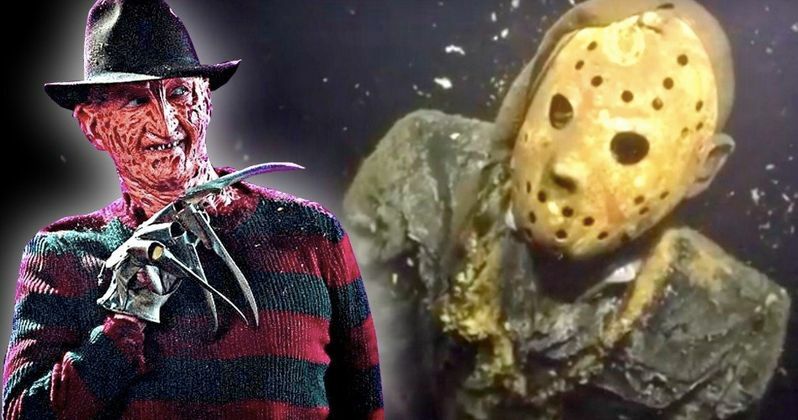 It was reported a few weeks ago that swimmers in a famous Minnesota dive spot were getting an unexpected scare when stumbling upon a Jason Voorhees statue at about 120 feet deep. Statue creator, Doug Klein, is now setting his eyes on adding Freddy Krueger from A Nightmare on Elm Street into the mix. It was believed that the Jason statue was at the bottom of one of Minnesota's 10,000 lakes, but he's actually at the bottom of the state-owned mine pit Louise, which is used for recreational diving and teaching. The Louise diving site has a lot more than just Doug Klein's tribute to Friday the 13th. Over the years, people have gone down to add plastic skeletons doing various acts including riding a bike and helming a pirate ship. Others have added mermaid tales as well as writing messages on some of the pipes. However, at 120 feet, where only the most experienced divers end up, is where Klein placed his Jason Voorhees statue. He dives down occasionally to clean up the statue's eyes but leaves the rest of the moss on it for creepy effect. A friend has been urging Doug Klein to make a Freddy Krueger statue to place at the bottom of the Louise dive spot, which he has agreed to do. He said, "I just gotta do it. I'll make them a little less buoyant, though, so I don't have to fight like I did." As for "them," Klein's next project before Freddy is Eddie, Iron Maiden's world-famous mascot. He already has all of the materials for Eddie and has already started to construct him. Doug Klein said that putting Friday the 13th killer Jason at the bottom of Louise was an actual "nightmare." Apparently, Klein constructed Jason in a way that made him too buoyant and it took over 8 hours to chain him 120 feet below the surface. After the first attempt of tying him down with ropes, the statue rocketed to the surface after one of the ropes broke, which sent Klein to get heavy duty chains and locks. It's been 5 years and Jason is still haunting divers that are able to make it down that deep to find him. The Louise dive site is about to get a lot creepier when Doug Klein finishes Eddie and the Freddy Krueger statues. It isn't clear when exactly he will place the new statues or where, which leads to the fun of it for the divers hoping to stumble upon the underwater horror icons. It will be interesting to see who gets the most pictures in the new Freddy vs. Jason underwater competition. You can check out the underwater Jason Voorhees statue below, and then read the full interview with Doug Klein to see his thoughts on the new Freddy Krueger statue over at the Minnesota Monthly website.